Today's challenge on SCS is called Key to My Heart. The key to my heart is my nieces and nephews. I lived away from them for 10 years and recently moved back and love having them over. My 10 year old niece came over last Sunday and helped me create more Valentine cards for her to give to classmates. She loved using the Big Shot to do some fun textured BGs and loved playing in the sequins to add some sparkle to the cards. We layered the papers then added the Green Duck embellishment and some sequins and ribbon. Thank you for looking at the cards my niece helped me create. 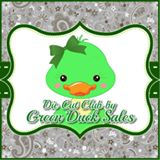 Check out my exciting news above on these fantastic Green Duck Embellishments!!! More beautiful cards by your niece; she is so talented. Like the embossed backgrounds against the die cuts. Perfectly done! Thanks Ann. She had a blast playing in my craft room. Love those candy hearts - such wonderful cards! Thanks Comelia. I am having a give away on February first four a free set. See the top of the blog for details. It is a great set available at Green Duck dies.